Marni Kyle has been an editor for more than 15 years, and a freelance writer since 2007. She has an extensive background in children's and young-adult publishing, as well as the health-and-fitness market. Kyle received a Bachelor of Arts in English from Western Connecticut State University. The balance beam is one of four main apparatuses that are used in competitive women’s artistic gymnastics. The beam itself measures 16 feet long and 4 inches wide. Early balance beam routines consisted of dance-based moves, including leaps, poses and acrobatic skills like walkovers and back handsprings. Today, competitive gymnasts perform multiple aerial elements and acrobatics skills on the beam, all the while stressing poise and maintaining balance and grace on the tiny platform. Pivot Turns: Maintaining a tight, straight body in high relevé, complete two 180-degree turns. Straight Jump: Maintaining a straight body, push off from the toes and close the legs together during a straight-up jump. Split Leap: Perform a split in the air while jumping from one foot and landing on the opposite foot, assuming a split position in the air. Scissors Leap: This leap has the legs changing positions while in the air, demonstrating two splits in one jump. Scale: Lift your leg back a minimum of 90 degrees and hold the position for at least two seconds. Needle Scale: Balance on one foot with the other leg lifted high, preferably showing a 180-degree split, to the back. The body is typically dropped forward during the Needle Scale, with the chest pointed down and the hands either gripping the ankle or grasping the beam. Cross Handstand: Lever in and out of a handstand while extending the body and closing the legs at the top. 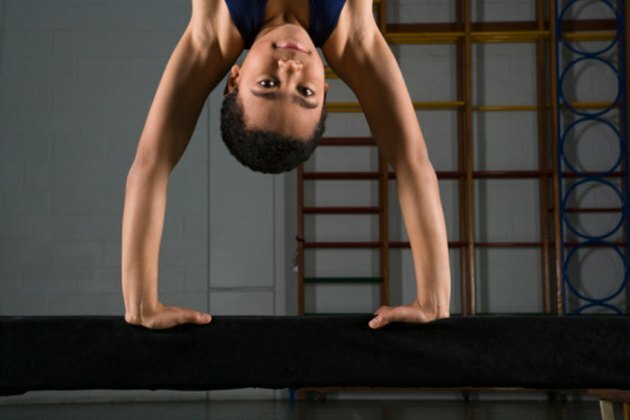 It is important that the gymnast’s hands be side by side while in the handstand position. Arabesque: This is a back leg lift at a minimum of 45 degrees, which must be held for at least one second. Omelianchik: Named after Romanian gymnast Oksana Omelianchik, this beam skill is a back dive with a one-quarter or three-quarters twist, landing in a handstand. Miller: This signature move, named after U.S. gymnast Shannon Miller, consists of a back dive with a quarter twist to a handstand, followed by a half pirouette. Borden: Consisting of a straddle pike jump done from a sideways position on the beam with a one-half or three-quarters turn, this signature beam move was named after U.S. gymnast Amanda Borden. The McCool: This beam mount is defined by USA Gymnastics as “a flyspring forward with flight before and after the hand support on the beam and lands on both feet -- approach at end of beam.” It was named after American gymnast Courtney McCool. 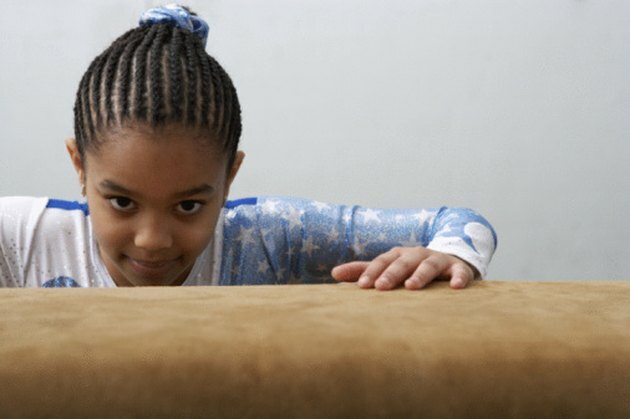 With each competitive season of gymnastics, beam routines evolve and increase in difficulty. The judges are checking for poise, balance, clean lines and stuck landings, but they are also always looking for gymnasts to take traditional moves to the next level. Just as many Olympic athletes have done before them, gymnasts will continue to execute signature beam moves with increased difficulty and flair.